On the back of a confirmed, rare, ’White Glove Sale’ (all Lots sold) of the Captain America Collection, Historics at Brooklands has announced full combined sales results from its first auction of 2011 on March 3rd, with 70% of all Lots finding a new home and bringing a total sale of £1,195,278. In addition to the 56-strong collection of American vehicles from the forthcoming Captain America film, there were a further 56 eclectic motorcars on offer to a capacity crowd at Brooklands. Of these, 23 sold on the night, with headline grabbers including an immaculate 1964 Aston Martin DB5 for £229,600, and a 1967 Shelby GT500 ‘Eleanor’ belonging to Tottenham Hotspur footballer, Benoit Assou-Ekotto, selling for £162,400. 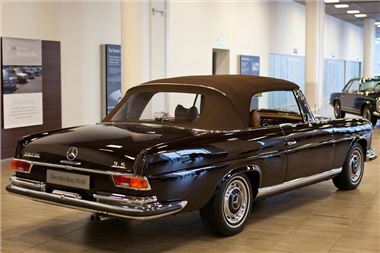 It was also another strong showing for the Mercedes-Benz marque, with a flawless 1970 280SE Cabriolet changing owners for £100,800, whilst the ever-increasing popularity of the 190SL – with Historics leading the market in 2010 - was strongly reflected in the sale of a white 1961 model for £49,280. The late withdrawal of a 1954 MG TF forced Historics’ staff to pull out all the stops in order to maintain the interest of MG fans, and an MG TD of the same year consigned at the last minute didn’t disappoint, selling for £16,352. Further evidence of the growing appreciation for more modern ‘classics’ was provided with the sale of a 1985 Ford Sierra RS Cosworth. With just 63,470 miles covered and being one of just 6,021 of the increasingly sought-after cars built, Historics sold the Moonstone Blue example for £14,000. For more information, and to consign Lots to the next Historics at Brooklands auction on the 21st May, call 0800 988 3838, e-mail: auctions@historics.co.uk, or see the website, www.historics.co.uk.